You plan to go to Orlando in United States in march : check the weather and seasonal norms here. The weather in Orlando in march comes from statistical datas on the last years. You can view the weather statistics the entire month, but also navigating through the tabs for the beginning, the middle and the end of the month. The rise in temperature that occurs over the days eventually makes the heat comfortable to the point that the climate throughout March in Orlando is almost perfect for a relaxing stay. However, there are a few occasional showers that may surprise walkers, especially in the early and late afternoons. The mornings, with mild but pleasant temperatures, are the precursors of magnificent afternoons - where it is possible to combine the heat with the superb sunshine. Even if the cottony clouds make a few appearances, they turn into rains only very rarely. The weather is then conducive to the practice of all kinds of outdoor activities. Following the gradual rise in temperatures, thus favoring a warm and welcoming atmosphere, the weather in Orlando throughout March has all the characteristics of an ideal weather. One can, in fact, combine the heat with the beautiful sunny days that follow yet do not resemble each other. Towards the end of the month, rainfall increases slightly in both intensity and frequency. This also results in a fairly significant decrease in temperature. As a result, the weather is slightly refreshing, however one can still enjoy the pleasantly comfortable atmosphere that defines the days. Only individuals who are sensitive to the freshness should wear light sweaters. In march in Orlando, the climate is quite dry (with 75mm of rainfall over 9 days). Unfortunately, the weather conditions is worsening than the previous month since in february there is an average of 53mm of rainfall over 8 days. The climate enjoyable there the month of march. Temperatures are up to 26°C. The seasonal minimum is 17°C. Thus, the mean temperature average in march in Orlando is 21°C. Note that these seasonal averages are in contrast with those observed in Orlando in the month of march with a maximum record of 33°C in 2015 and a minimum record of 3°C in 2013. Day length in Orlando in march is 11:59. 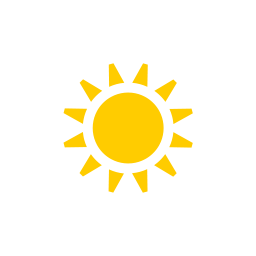 Sunrise is at 07:35 and sets at 19:34. With a good weather, the month of march is a good month to go in that area in United States. Check below seasonal norms These statistics are generated from the weather statements of the past years of march. Weather data for Orlando for march are derived from an average of the weather forecast since 2009 in Orlando. There is a margin of error and these forecasts are to be considered as general information only. The weather in Orlando can vary slightly from year to year, but this data should limit surprises. So you can pack your bags or check for the best time in year to go to Orlando. Best time to go to Orlando?